One of the things I love about Paris is that no matter where I go, something interesting is always happening. After our rough day when we saw the scooter accident, I decided Bug and I needed to get out and do something or we were going to drown in misery. I’m glad we did – it was just what we needed. Right now, about two blocks from my apartment is a week long FREE nightly concert of pop/rock bands. The other night, the band was Pony Pony Run Run and I loved their music so much I bought both their albums. 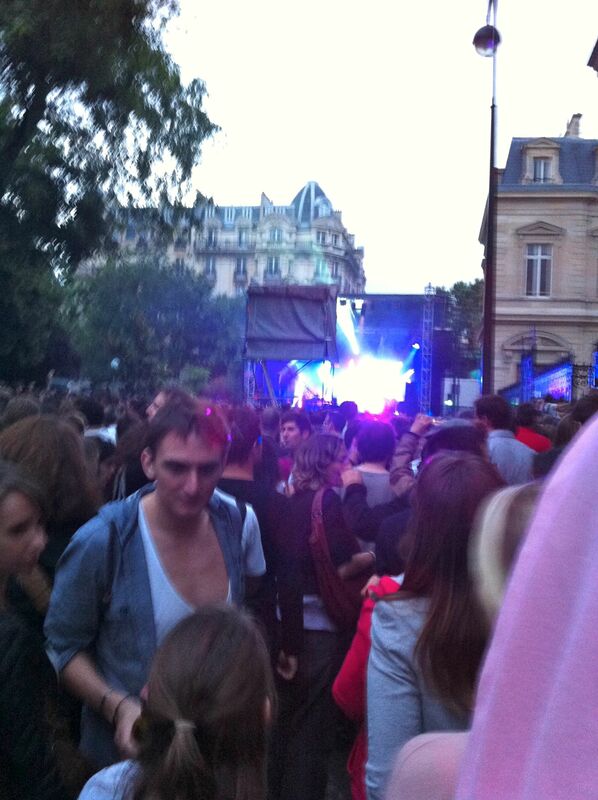 Summer Concert Series in the Marais. Like on Fete de la Musique, the restaurants around the venue rolled out beer carts. I can’t drink beer (it’s off limits for Celiac’s), so Bug convinced a bartender to sell him a bottle of wine. They included two glasses and we joined the other concert-goers for an hour of fun. It was still light when the concert was over, so we wandered over to a restaurant and had a delicious dinner. 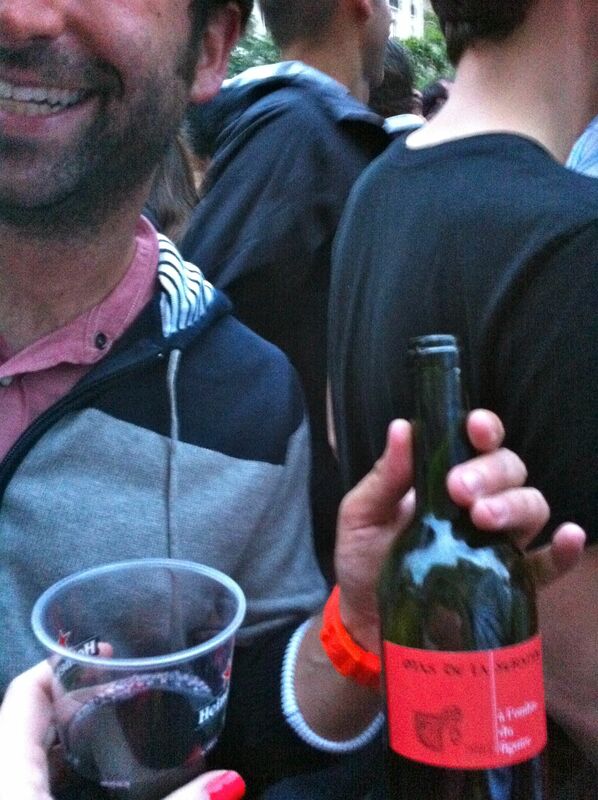 A bottle of red, two plastic cups, my husband, and live music. Perfect night in Paris. I felt like saying, “Ha! Normally I get in every four weeks. But let’s talk about my month, okay? Because if I told you about it, you’d be surprised I’m even functioning. Hell, my therapist is surprised I’m functioning.” Instead, I kept my eyes closed and focused on her ripping the hair out of my body. It was weirdly calming. After the apartment showings, Bug made an appointment for me to get a color and cut at a place called “Space Salon.” It looks like it was staged by the Jetson’s set designer. He hauled me in there, handed me off to a very British man named Liam, whose closely cropped and very exposed chest hair was oddly mesmerizing. Liam decided I have a gorgeous strawberry color and that I should stop fighting it. So highlights and a cut have been ordered for Thursday. If I come back looking like an extra in some SCI-FI Dystopian, it’s Bug’s fault and you may stone him. I’ll probably be curled in the corner, traumatized. 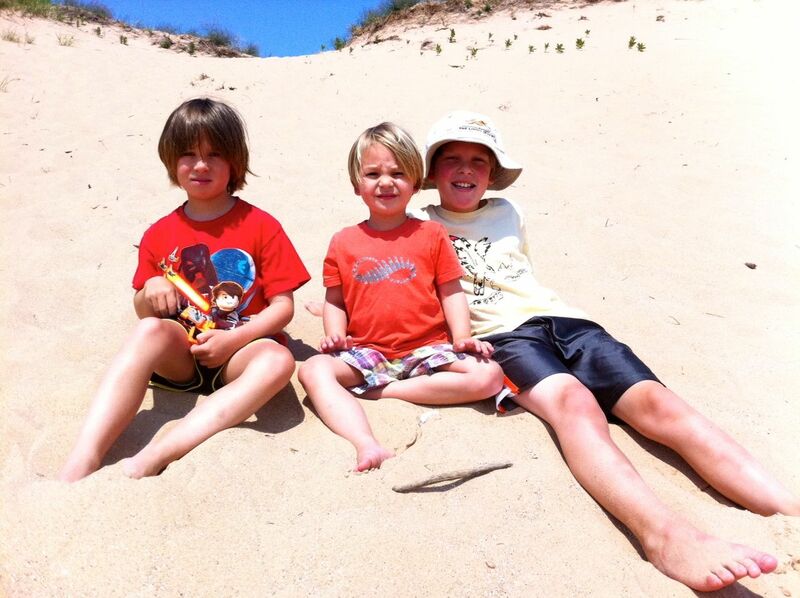 Finn, Boone, and Keegan at the Sleeping Bear Sand Dunes. ha! I want to see pictures after your hair cut! and I’m glad you are having a slightly better day after the horrible month! I’ll post pics even it turns out to be a lopsided faux-hawk. I’m all about public self-embarrassment – lol. First I have to say that no matter where you are (emotionally) in your life you always make me laugh out loud when you describe your days or unlit stair nights as the case might be. I also want to see your new do, preferably with a shot of that salon in the background. Just tell the chest hair trimmed stylist that you’re a famous author/blogger and he’ll swoon at your feet. How are those flats doing, btw? yes, i want to hear about your salon experience in Paris as well. When I was there I just lurched outside the door watching. I am sure you will love the experience.